The Smoke Pencil Adapter tip is an optional removable adapter that attaches to the top of your Smoke Pencil so you can get a very fine, but dense stream of smoke from your Smoke Pencil. This Adapter tip is very useful if the testing you are doing involves small areas or light air currents that are otherwise difficult to detect. The Adapter Tip holds a very small low velocity fan that forces the smoke out of the restricted tip. 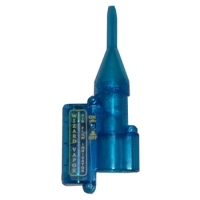 The Adapter Tip runs on one (1) AA size battery and has an independent on/off switch.